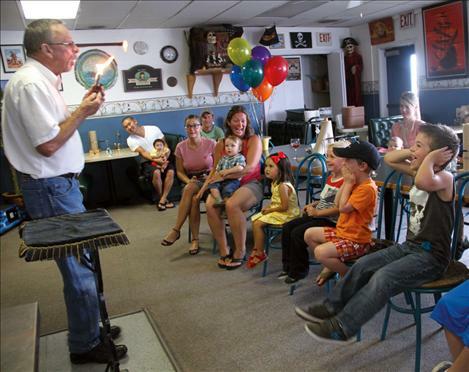 Ken Avison, owner of the Cove Deli and Pizza, performs his 500th birthday party magic show last Friday night. 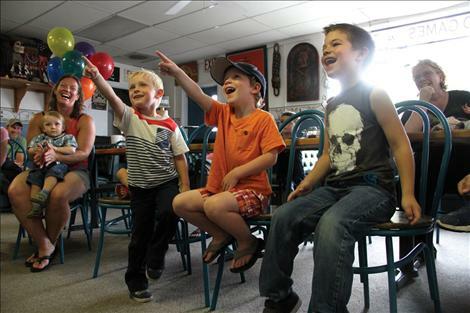 Amaya Shizuku, Finn Goddard and Jaspin Fisher enjoy a magic show Friday, Aug. 8 at the Cove Deli and Pizza. What do a flaming phone, a rope and a bunny have in common? Magic, that’s what. And the undivided attention of an eager, young audience. 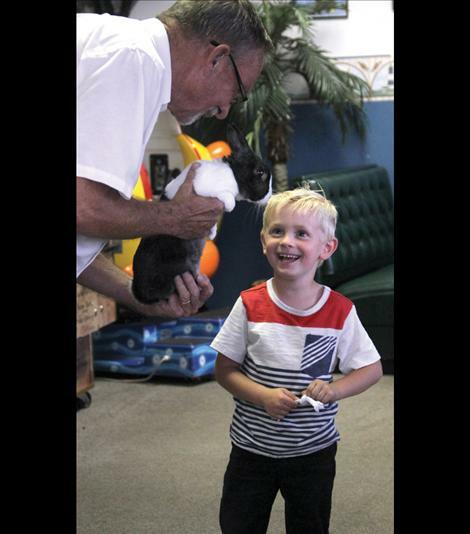 Local businessman and magician Ken Avison, owner of the Cove Deli and Pizza, has entertained folks of all ages with his magic shows for more than 50 years. “I started when I was a kid and I’ve never grown up,” he says. Avison estimates his introduction to magic was sometime between 10 and 12 years old, while watching the Ed Sullivan show. After that, he spent hours in the public library researching magic. For his first trick, he produced a silk scarf from a toilet paper tube. It wasn’t long before he was putting on neighborhood shows for which he’d charge a penny or nickel admission. As an adult he has performed magic professionally for several years and is a member of the International Brotherhood of Magicians. After opening the Cove Deli and Pizza 11 years ago, Avison seized the opportunity to perform for his patrons and has made a name for himself and his restaurant through the birthday party magic shows he performs. 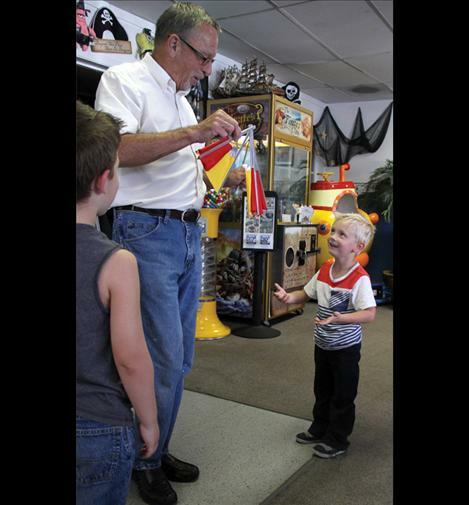 “I can’t go anywhere where some little kid doesn’t yell, ‘There’s the magic man!’” he said with a laugh. Last Friday Avison performed his 500th birthday party magic show at the Cove. 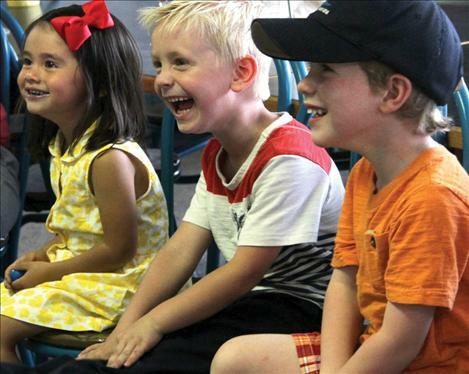 Adults and children alike were entertained with his tricks, quick wit and humor. Engaging with his audience — being on stage and reading their cues — is a challenge Avison enjoys. “I get the best seat in the whole place because I get to watch the kids and their reactions,” he said. Avison’s grand finale trick involves a serving tray, flames and his partner in magic — a soft, furry bunny aptly named Houdini the IV. Amid peels of laughter, applause and whispers of “how did he do that?” Avison grins and basks in the audience’s appreciation. It is apparent that after 50-some years, he still enjoys performing. After the children get to pet Houdini the IV, the 20-minute show concludes. What follows is the next best thing after a magic show. And what’s that? Well, pizza of course.